Posted on June 6, 2012 at 10:10 pm. Ray Bradbury died today. He may well have been the greatest sci-fi writer of the twentieth century. I really can’t say as I haven’t read his work. You read that right; and it is an ignorance that also extends to the rest of science fiction. I do at least have the decency to recognise this as a failing. Despite my interest in rocketry, sci-fi is just not a genre that moves me. 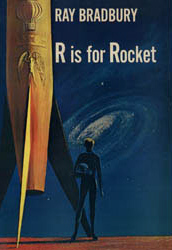 I have resolved however that the next time I’m in the National Library of Scotland, I will dig out Bradbury’s ‘R is for rocket’. The title alone is a triumph. 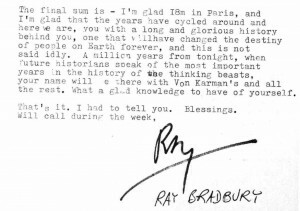 My passing interest in Bradbury was kindled a few weeks ago coming across a letter that he wrote to Frank Malina, one of the founders of the Jet Propulsion Laboratory, who remains the primary focus of my own book. Malina is not exactly a household name but he certainly should be: he designed and oversaw the construction of the world’s first successful sounding rocket, the WAC Corporal. Robert Goddard has carried the acclaim for the first liquid fuelled rocket. It rose to a height of 41 feet. Malina’s rocket, by contrast, was the first American rocket to reach space. And when it was grafted on to a V-2 to form the BUMPER WAC Corporal, it became, in 1949, the first human artefact to reach into extra-terrestrial space – an astonishing altitude of 244 miles, eight years before Sputnik. Bradbury knew all this. He visited Malina in Paris in 1980, just a year before he died. They must have been reminiscing about the early days at JPL in Pasadena, and certainly talking about Malina’s colleague Jack Parsons. (A self-taught chemist who perfected a castable solid rocket fuel, Parsons is perhaps better known for his libertarian writings and devotion to the Thelema occultism of Alesteir Crowley). In Bradbury’s letter, he writes that on returning to his hotel he had a sudden memory of being at a Los Angeles Science Fiction Society meeting in 1939 or 1940 listening to a young scientist talk of rockets and the future. In an instant he realized that this young man was in fact Parsons. ‘I was stunned and touched’ wrote Bradbury, ‘to think our lives almost touched, so long ago’. There is a ‘long and glorious history behind you, one that will have changed the destiny of people on Earth forever, and this is not said idly. A million years from tonight, when future historians speak of the most important years in the history of the thinking beasts, your name will be there with von Karman’s and the rest. What a glad knowledge to have of yourself’. In the intervening thirty years, Malina is known to a comparatively small community, mostly historians of science and – given Malina’s art practice – historians of art. But Bradbury’s prediction may yet be proved correct.